"I called others claiming to rent ramps. The Yard Ramp Guy actually does!" 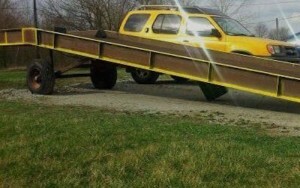 for my used yard ramp." Welcome to The Yard Ramp Guy. You can call us “The Portable Loading Ramp Rental Guy” or “The Used Forklift Ramp Guy” or “The Loading Dock Rental Guy.” We always answer the phone. Our approach: first we earn your trust, and then we earn your business. As a leading dealer for top manufacturers of yard ramps, we're able to pass along significant savings on new ramps, while providing unsurpassed customer service for the warehouse, fulfillment and shipping-logistics industries. We also sell used steel yard ramps. Maintained at depots across the U.S. to reduce shipping costs and delivery times, our used inventory is the largest in the industry. These are also available for renting to handle temporary needs (one month minimum). By pioneering expanded options for purchasing yard ramps, The Yard Ramp Guy has earned the trust and loyalty of material handling professionals from a variety of industries. Need to sell a ramp? Our brokerage services are unprecedented in the industry. of existing used and rental ramp locations. “The experience working with The Yard Ramp Guy was outstanding. Having done this for some time now all across the country, it was a huge relief when this process went as smoothly as it did. I credit your staff with outstanding communications. That is what I valued the most throughout the process. Every email and call was answered immediately, and you all took the time to assist us with every aspect—from purchase all the way to offloading. Continued support when I had questions or concerns were handled right away and with much respect. With a minimum one-month rental period, The Yard Ramp Guy® provides options for handling temporary or seasonal ramp needs. 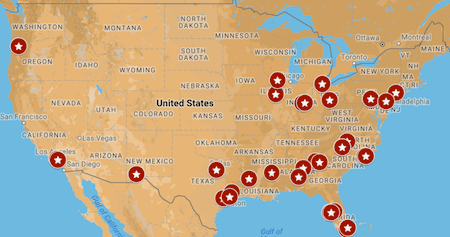 To help reduce freight costs, our rental yard ramps are located near metro areas across the continental U.S. In fact, most of our rental yard ramps' locations are within 250 miles of 90% of the population! Check out our Rental FAQ for more details. We offer the largest selection of high quality used yard ramps in the country, with depot locations across the U.S. Each used ramp that we sell must pass a stringent evaluation process. Check out our online used inventory page for detailed specs, photos, prices and locations of each of our ramps. Be sure to call us if don't see a ramp that matches your needs, as new acquisitions may not be immediately posted. As a high volume dealer for top yard ramp producers, including Bluff Manufacturing and Medlin Equipment, The Yard Ramp Guy® is able to pass along significant savings on new ramp purchases. What's more, our value pricing is matched with exceptional customer service in executing your order to ensure on-time delivery. Explore our financing page for payment options and to learn about tax advantages of purchasing new ramps. Whether new or used, a quality yard ramp enables you to streamline your entire operation, from crew safety to being on time with delivery. The Yard Ramp Guy conducts thorough evaluations before adding any used yard ramp to our inventory. And we'll describe the benefits of our industry-leading yard ramp rental for your business, expertly matching our equipment to your needs. Should your yard ramp be constructed of steel or aluminum? We'll discuss steel yard ramp benefits to help you your requirements with you and present the benefits of each—including Durability, Affordability, and Portability—to help you decide. Our short-term yard ramp rentals provide delivery of your ramp anywhere you need it. When a large sporting event producer needs to load and offload a million pounds of staging equipment for a four-day event at an outdoor arena without loading docks, they call The Yard Ramp Guy. For warehouses with temporary surges in shipment processing, we offer longer-term rental options to prevent standstills in productivity of loading and unloading of seasonal freight. Whether you're looking for permanent or temporary loading ramp solutions, our new and used yard ramps continue to help streamline our customers' business operations. A number of factors go into deciding the specific type of yard ramp you need in order to streamline productivity. What are the average pallet shipment weights? What size forklifts or pallet jacks do you use for loading and unloading? 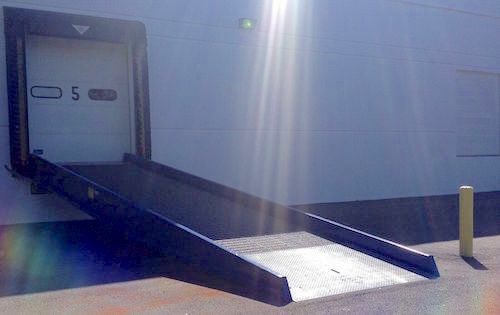 Will you move the ramp to different loading dock positions around the warehouse during the course of its use, requiring easy yard ramp mobility? Contact The Yard Ramp Guy team. We'll discuss your specific requirements and your options, including: the advantages of new vs. used yard ramps for sale, the benefits of buying and renting a used portable loading dock, and how you can easily convert your portable loading ramp rental into a purchase. Yard ramps from The Yard Ramp Guy include many standard features and options enabling you to get the yard ramp that best suits your needs. Use these guidelines to easily determine the most efficient and effective ramp for your application. You can easily move a quality yard ramp into position at trailers, railcars, or loading docks. The operator utilizes a self-contained, double-acting hydraulic pump to adjust the ramp unit to the proper position. In minutes, you are ready to load or unload freight. Solid 18" rubber tires facilitate easy positioning and towing. Open serrated steel grating provides excellent forklift traction while preventing build-up of snow, water, and other debris. Beveled approach assures a smooth transition. 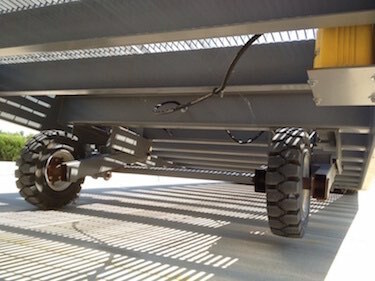 For truck-to-ground or railcar-to-ground loading applications choose a 36' unit including a level off. Choose a 30' straight design for quick loading dock-to-ground applications. Two hydraulic cylinders allow smooth and quick rising of ramp's front lip to desired height. Open release valve to safely lower unit into place. Internally mounted pump is protected from damage. Tubular steel box undercarriage assembly. 18" wheels with solid rubber, pneumatic profile for easy positioning. For stationary docks, choose 30' or 36' without wheel assembly. Serrated grating provides excellent forklift traction. Open design prevents buildup of water and debris. Lower end approach plate gives maximum support and smooth transition on to ramp. 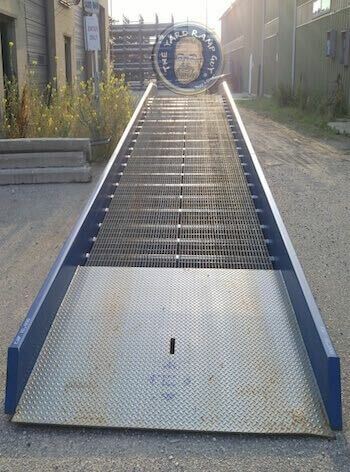 Standard safety chains hold yard ramp securely to trailer or dock. The optional ramp clamp assists operator in moving the yard ramp over short distances. Forklift inserts into swiveling lift loop and is secured by locking device. The optional tow bar features a fast-locking, easy hook-up to the yard ramp and makes towing over long distances practical. This is particularly important in handling pallets next to openings. The 36' with level-off is most popular where end loading or roof clearance is required from trailer or railcar and with refrigerated equipment. * Lengths and widths can be customized for your application. What genuinely makes us different? We win on price versus other dealers and versus factory-direct. We don't just say we rent yard ramps; we really do. We pay used yard ramp sellers more than the competition does. We earn your trust, and then we earn your business. How do we win on pricing? How? Purchasing Power! The top two manufacturers of yard ramps rank The Yard Ramp Guy as their #1 dealer for the category. We pass our cost savings on to our customers. How do we rent when others only say they rent? The Yard Ramp Guy has mastered the business of yard ramp rentals. With yard ramps located throughout the United States, most of Yard Ramps, Inc. inventory sits within 250 miles of 90% of the population. This results in considerably reduced delivery and return freight costs. How (and WHY!) do we pay top dollar to sellers of used yard ramps? We understand and accept what’s required to assure a win for the seller of used dock ramps, a win for the buyer and a win for The Yard Ramp Guy. 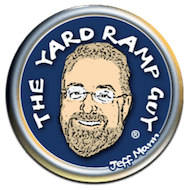 What should you expect when working with The Yard Ramp Guy? You should enjoy a respectful and continuous flow of communication. During your purchasing process, expect follow ups. While processing your sale or rental, expect updates. And expect a sincere thank you when our work is done.